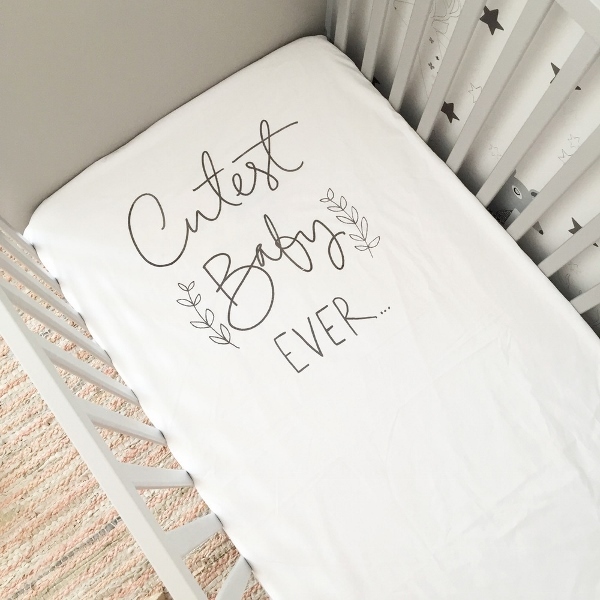 If you have a cot in your home, reserved for the cutest baby ever then you’re going to love these dreamy cot sheets. Here at Babyology we love when we find stunning nursery linen and even more so, we love when the brands we find come out with stunning new designs. Prepare yourself for a cuteness overload Babyologists because the new release from our friends at Little Louli is worth hanging around for. Our friends at Little Louli have done it again. Back in June 2014 we discovered the beautiful works of Lucy, the creator of Little Louli when she launched her linen range for children’s beds. We are now excited to share with you all the new addition to her range of heavenly hand printed cot linen. The gorgeous new Cutest Baby Ever fitted cot sheet, is 100 per cent cotton and will fit most standard size cot mattresses. The fitted white sheet is simple yet delightful and anything but plain. Available in either gold or charcoal print they are the perfect statement piece for any modern nursery. Priced at $69 and available directly from Little Louli.